Bright yellow Partridge Pea (Chamaecrista fasciculata) flowers peek out from between the stems of taller grasses and flowering forbs in meadows, prairies, stream banks and other open areas from July through early September. 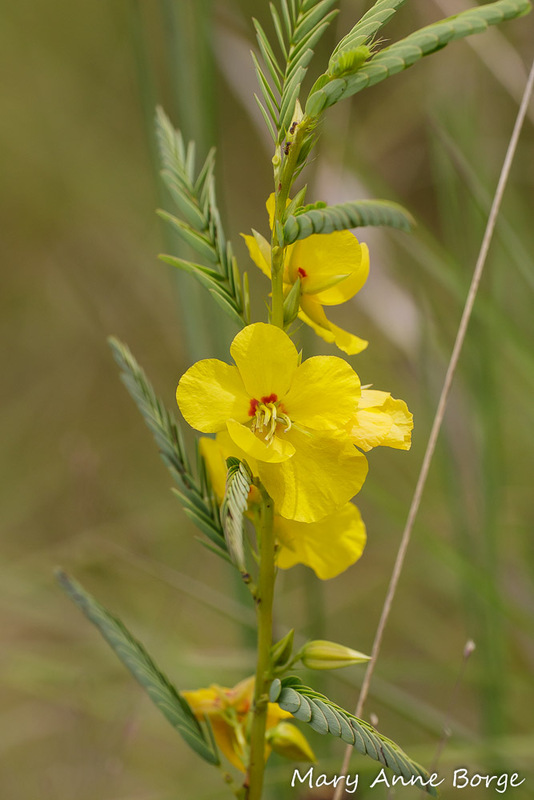 Partridge Pea’s flowers are tucked in the leaf axils down the length of the stem. Each flower has five yellow petals, with one much longer than the other four, and another partially curled toward the center of the flower, where its reproductive parts are located. A 1992 study showed that the curved petal directs floral visitors to the flower’s reproductive parts, first to the pistil (female reproductive part), and then the stamens (male reproductive parts). The red smudges on the petals are part of the visual allure to pollinators. In the Partridge Pea flower in the photo above you can see the three evenly sized petals at the top, one petal in the lower left that curls toward the center of the flower, and an over-sized petal at the lower right. The stamens are mostly clustered at the middle of the flower. The pistil resembles a hook projecting from beneath the right-most stamen. It is visible at the top of the over-sized petal. Imagine a pollinator coming in for a landing using the over-sized petal as a runway, guided by the curved petal, with the red smudges on the petals as beacons. The pollinator brushes first against the receptive stigma at the tip of the pistil, depositing pollen from the last flower visited, then moves on to harvest pollen from the stamens. 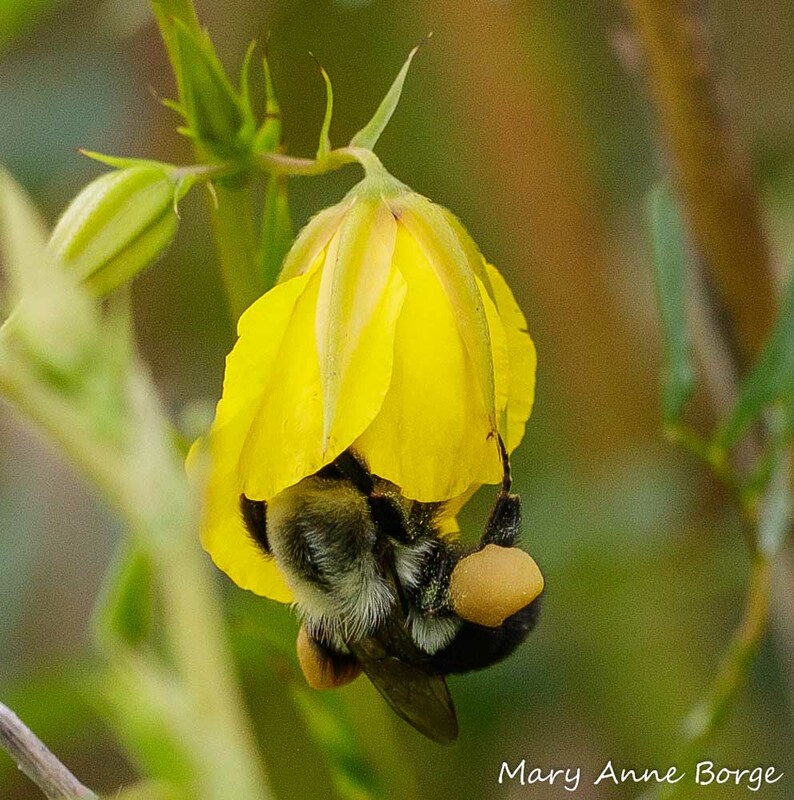 Bumble Bee harvesting pollen from Partridge Pea (Chamaecrista fasciculata) flower. 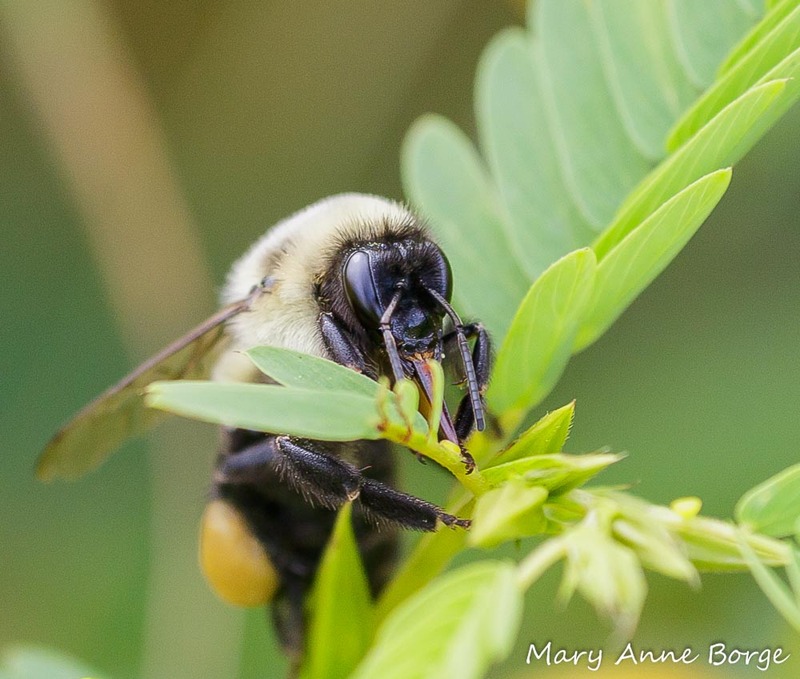 Bumble Bees are adept at buzz pollination. 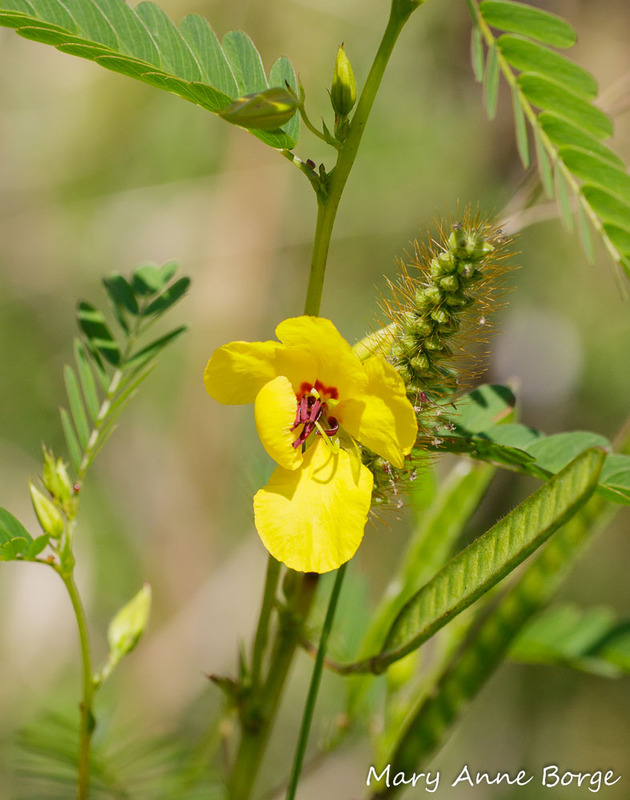 Partridge Pea flowers offer pollen as a reward to their visitors, but they don’t produce nectar. As a result, bees that collect pollen are the most likely visitors of the flowers. But the bees have to have skills in order to harvest Partridge Pea’s pollen, since it requires special handling in order to access it. The pollen is dispersed through a slit at the tip of the stamen’s anther. Pollen can be shaken out of the anther as a result of buzz pollination, a technique in which a bee clings to the flower while vibrating its wing muscles without actually moving its wings. ‘Milking’ the anther with a series of strokes is another method of successfully harvesting Partridge Pea’s pollen. Honey Bee harvesting pollen from Partridge Pea (Chamaecrista fasciculata) flower. Honey Bees can’t perform buzz pollination, so may be using the ‘milking’ technique. 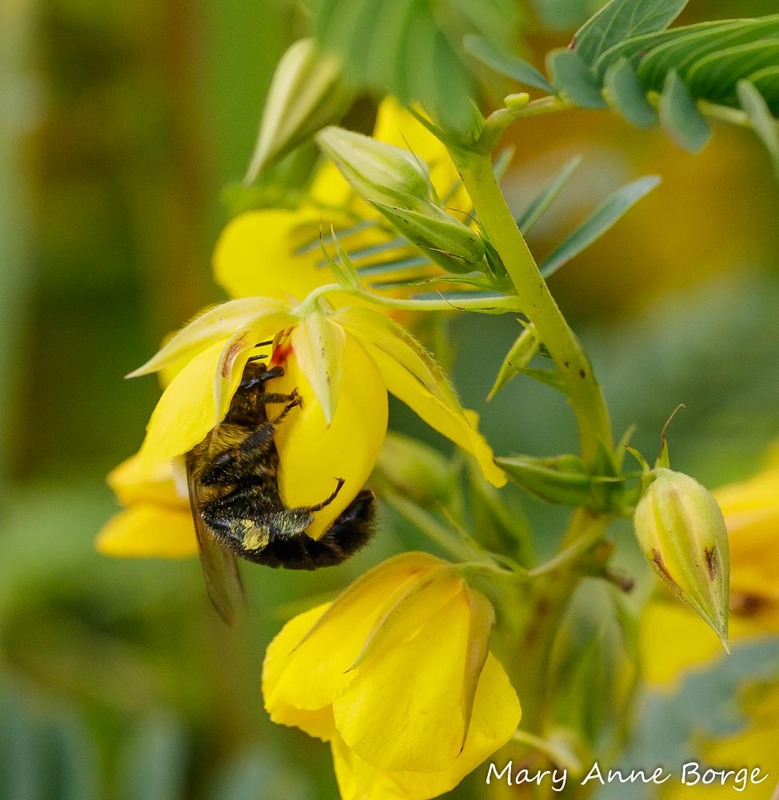 Eastern Carpenter Bee harvesting pollen from Partridge Pea (Chamaecrista fasciculata) flower. Butterflies aren’t interested in Partridge Pea flowers, since they don’t offer nectar. 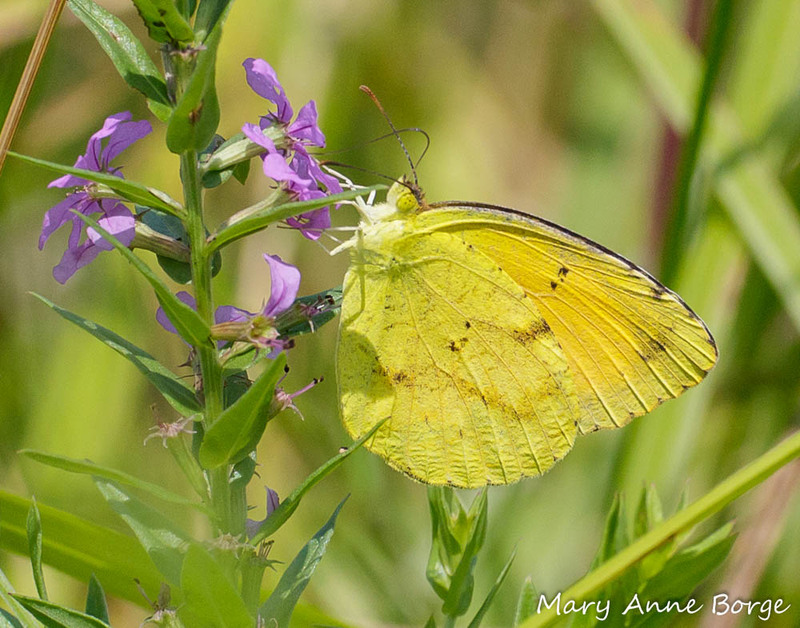 But several butterfly species use Partridge Pea as a food plant for their caterpillars, including the Sleepy Orange and Cloudless Sulphur. Gray Hairstreak and caterpillar on Partridge Pea (Chamaecrista fasciculata). Can you see the tiny caterpillar clinging to a leaf in the lower left of the photo? 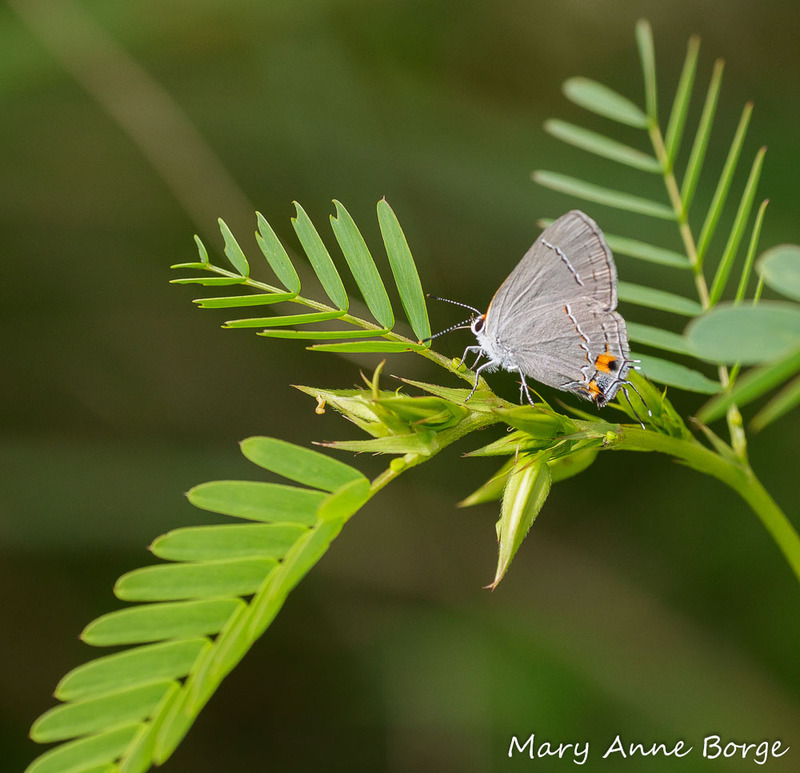 When I saw a Gray Hairstreak butterfly spending time walking around a Partridge Pea plant, it seemed possible that this was a female laying eggs. 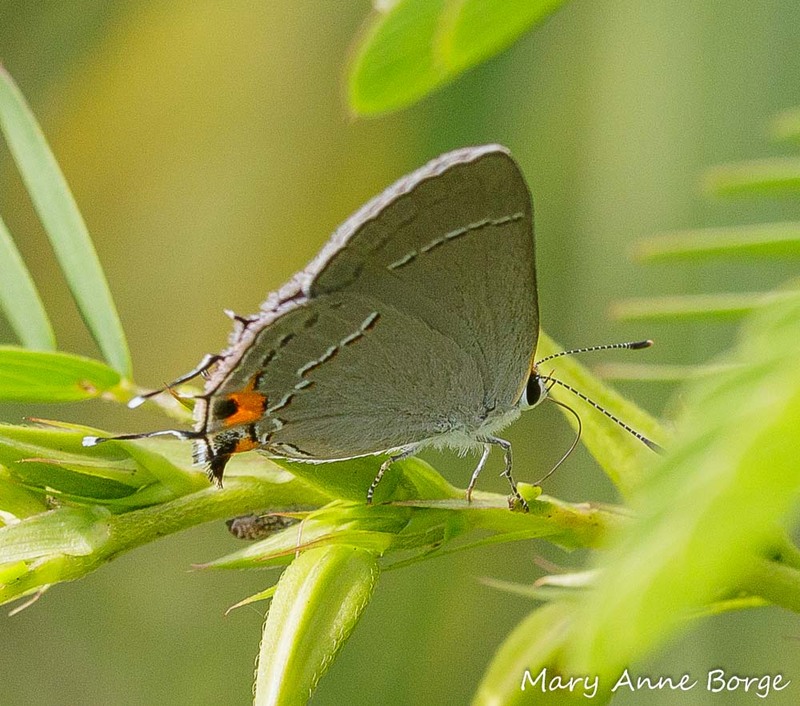 Gray Hairstreaks use some Pea family members as caterpillar food, including clovers and tick-trefoils, although I haven’t seen any confirmation that they would use Partridge Pea. 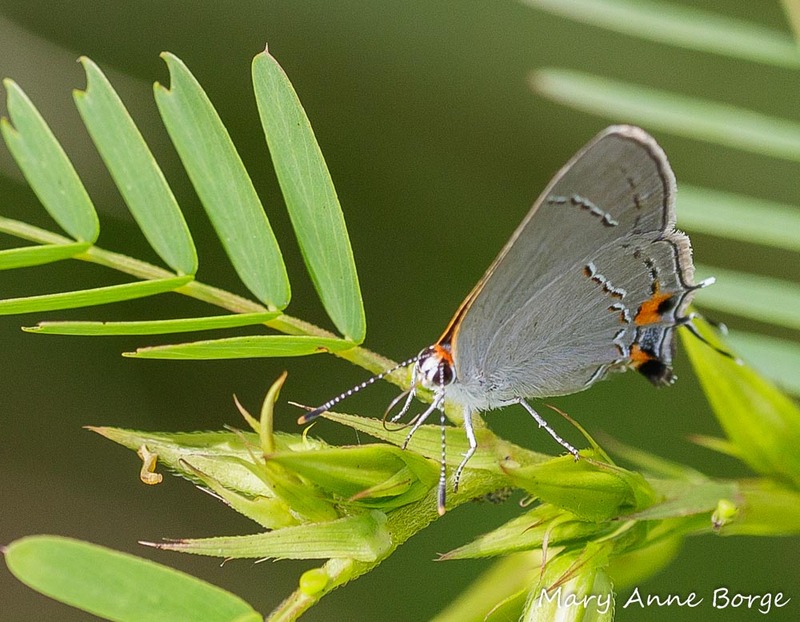 Gray Hairstreak on Partridge Pea (Chamaecrista fasciculata). 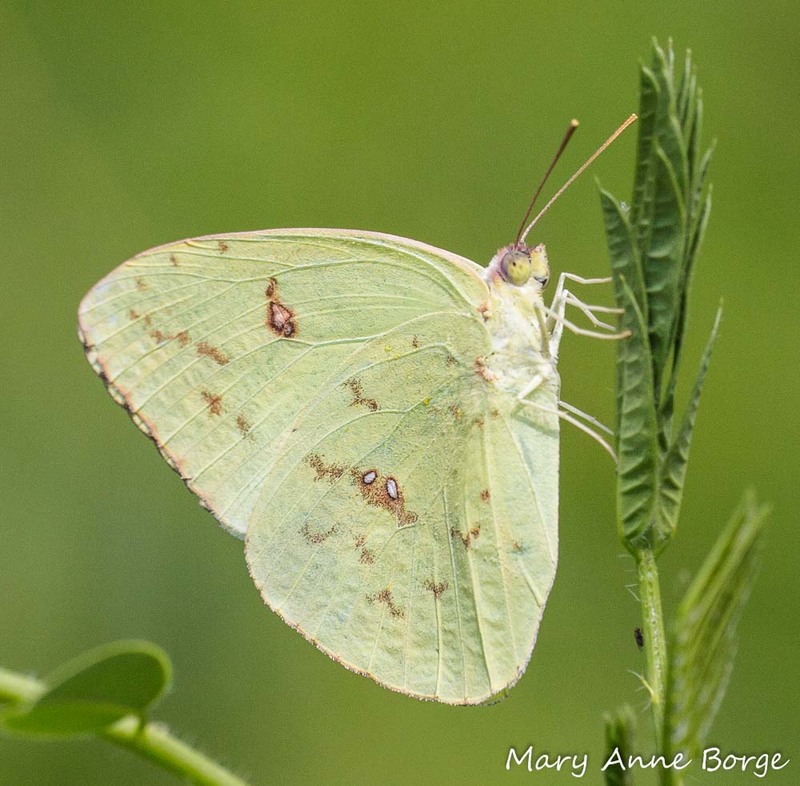 A closer look showed that the butterfly was visiting Partridge Pea for nectar after all, but it was nectar that is made available through extrafloral nectaries on the base of the stem of each leaf. This was a great benefit for the butterfly, but not much help for the plant, since the butterfly offered no services in return. When present, extrafloral nectaries are generally a plant’s adaptation to entice insects that are predators of herbivores to visit and protect the plant. Ants are especially important in this role, since caterpillars are a very desirable food for them. Some wasps and lady beetles are also potential protectors of plants. 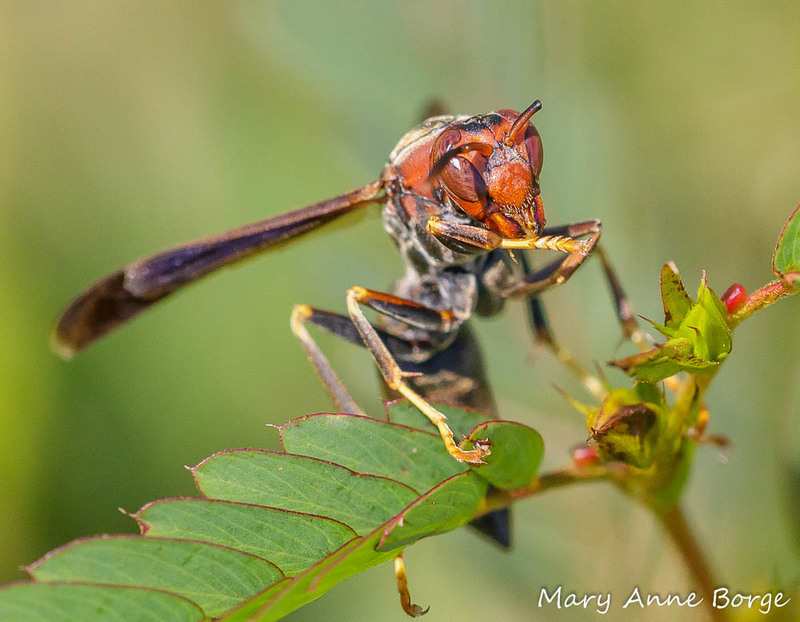 While they are interested in nectar for themselves, they are also on the hunt for insects to feed to their larvae. The wasps and lady beetles may rid the plant of the caterpillars or other insects who would eat it. Nectar is provided in exchange for this protection. 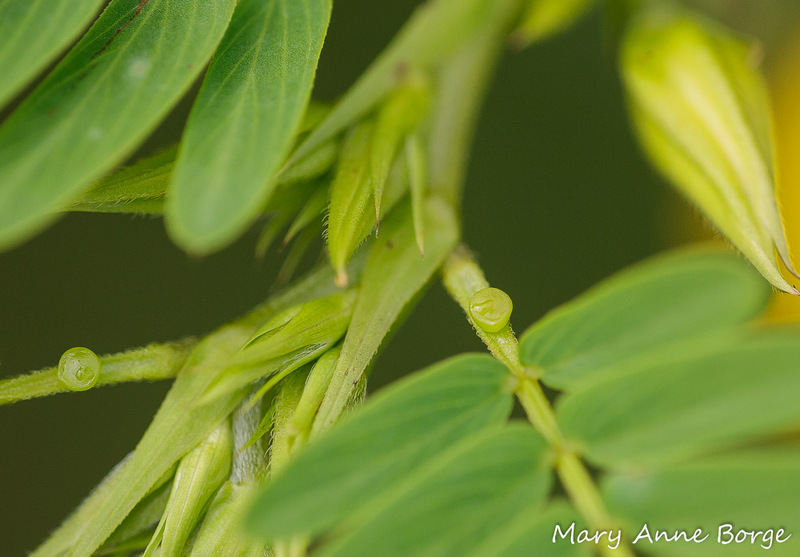 Partridge Pea’s extrafloral nectaries look like tiny open pots, glistening with nectar, an open invitation to thirsty insects cruising through, not all of whom will offer services to the plant. The two round pot-like appendages near the base of the Partridge Pea (Chamaecrista fasciculata) leaf stems are the extrafloral nectaries. Notice the glistening drops of nectar oozing from them. While I have seen ants working Partridge Pea extrafloral nectaries, I was surprised at the variety of insects I saw drinking from them at one location I visited. It makes me wonder whether the cost of providing this nectar is worth the protection gained from them. In addition to the Gray Hairstreak, I watched while a Bumble Bee spent more time visiting the extrafloral nectaries than the flowers. 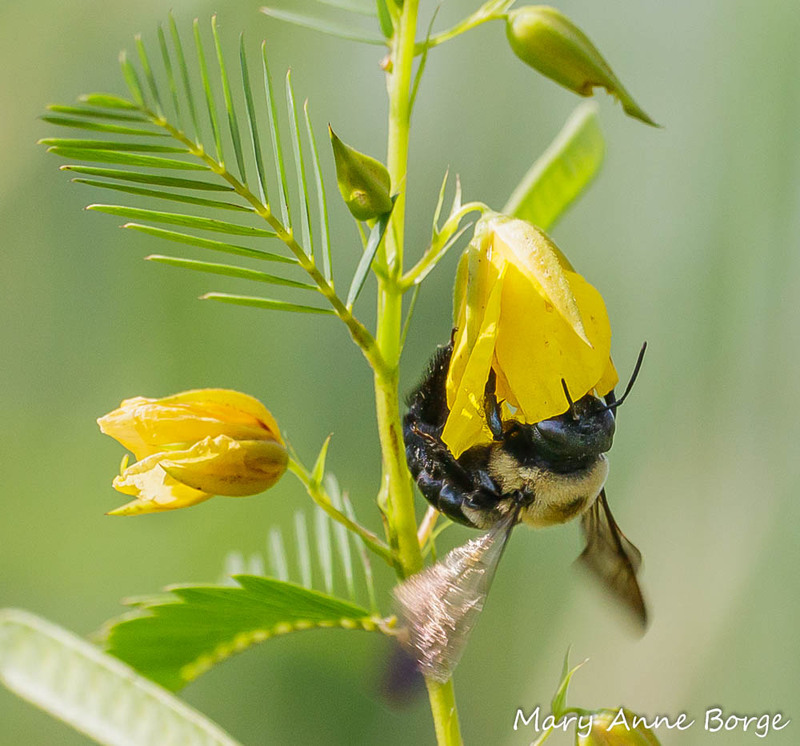 Bumble Bee drinking nectar from a Partridge Pea (Chamaecrista fasciculata) extrafloral nectary. After visiting several extrafloral nectaries, the Bumble Bee moved on to a flower. 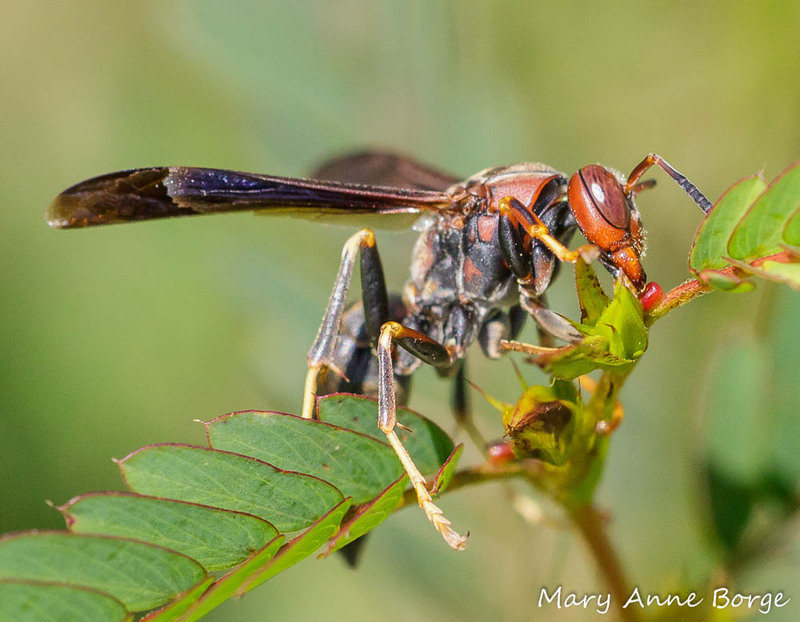 I saw several Paper Wasps visit the nectaries. Since these wasps hunt caterpillars to feed their larvae, they do have the potential to provide a service in exchange for a tasty drink. 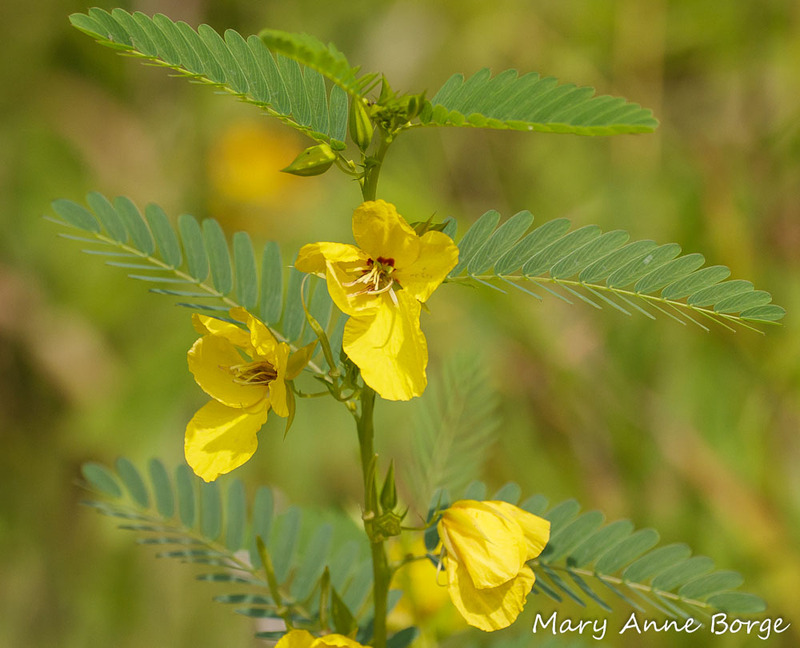 Some accounts of Partridge Pea say that the leaves will sometimes fold up when they are touched. I’ve tried it several times, but I have never had Partridge Pea respond to my touch. 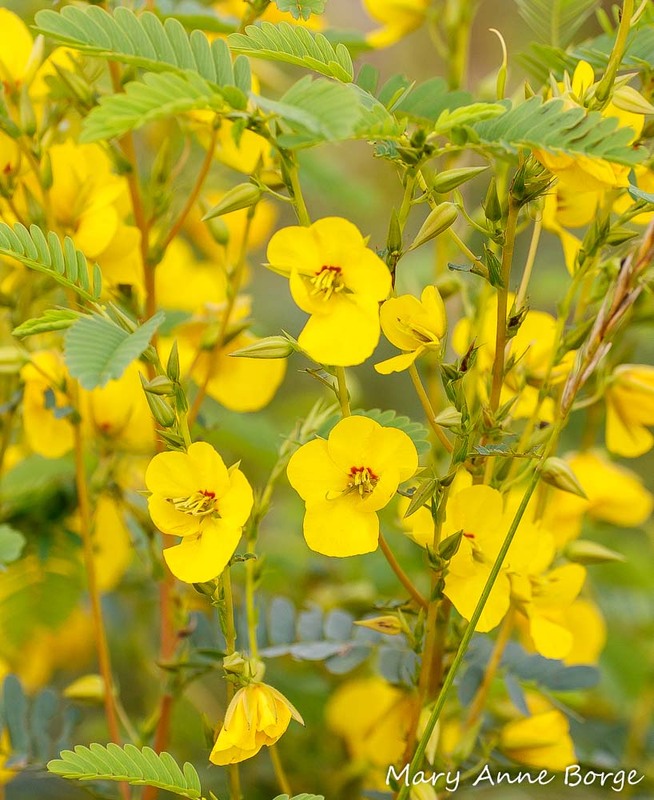 However, I have seen Partridge Pea plants with their leaves folded, so I’m guessing the plant folds its leaves in response to some stimuli, but I haven’t found an explanation for what it might be. Maybe it’s a mechanism to prevent excessive water loss on hot, dry, or windy days. Or maybe the plant responds to the touch of a butterfly laying eggs, and wants to minimize the leaf surface available to her. I wish I knew! Partridge Pea (Chamaecrista fasciculata) with leaflets folded. What prompted this? If the name didn’t give away its family heritage, the fruits identify Partridge Pea as a member of the Pea or Bean (Fabaceae) family. These fruits are an important winter source of food for birds, especially Bobwhites and Greater Prairie Chicken. Partridge Pea (Chamaecrista fasciculata) with fruits typical of the Pea (Fabaceae) family. 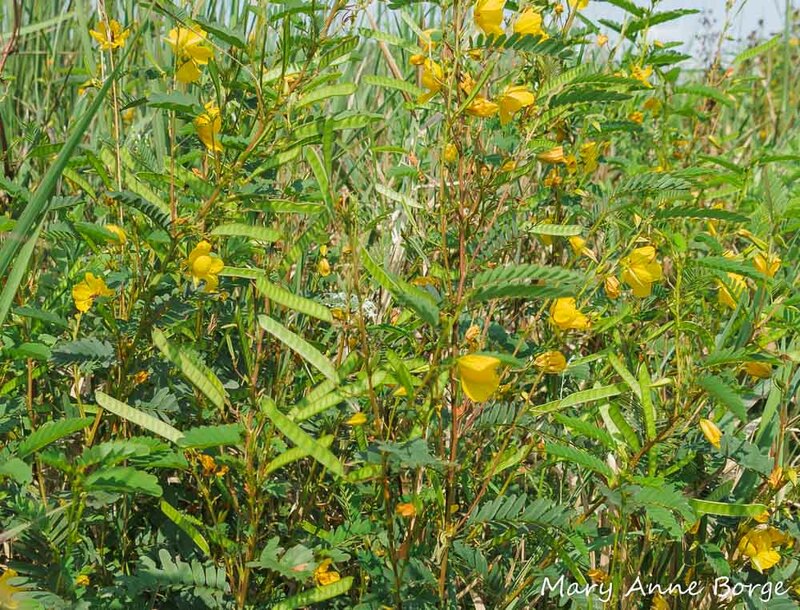 Partridge Pea is an annual, but reseeds itself readily. It likes sun, and can tolerate poor, dry soils. It helps to fertilize soils through its release of nitrogen, and is sometimes used in stream bank stabilization. 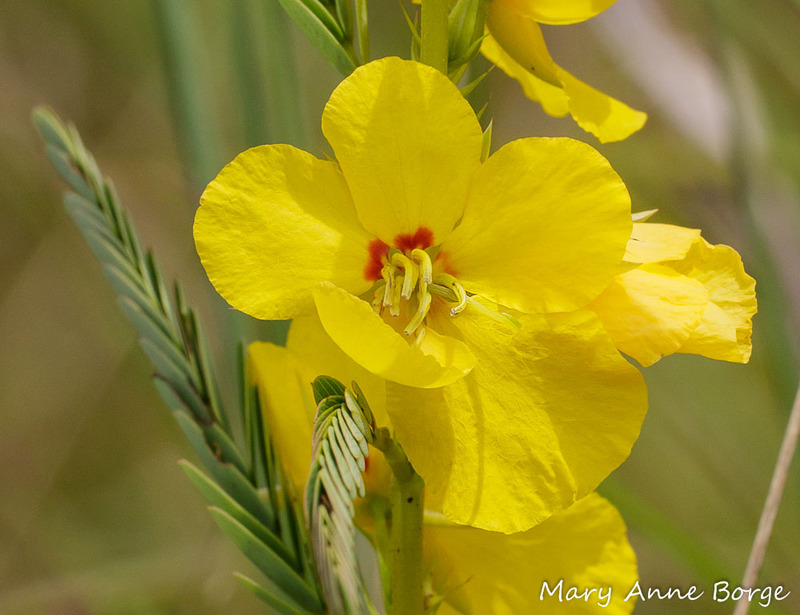 Partridge Pea is native from Rhode Island to Minnesota in the north, south as far as southeastern New Mexico, and from Texas to Florida. ,  Pollination and the Function of Floral Parts in Chamaecrista fasiculata, Andrea D. Wolfe and James R. Estes, 1992. 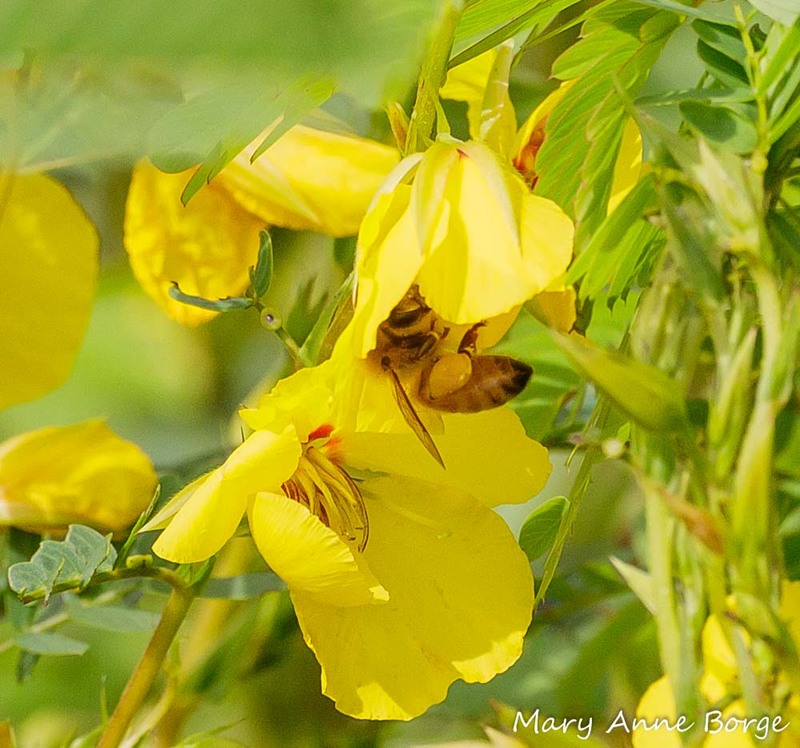 This entry was posted in Birds, Butterflies, Gardening for Wildlife, Native Plants, Nature, Other Insects and Spiders and tagged Chamaecrista fasciculata, Extrafloral nectaries, nature, Partridge Pea by Mary Anne Borge. Bookmark the permalink. Very informative post, and, as always, very lovely photography. I live in central NC and have a member of the chamaecrista genus (possibly chamaecrista nictitans?) growing in the weedy places in my border. Last year I noticed how the dried seed pods would snap open and spew their seeds. What I have found with the chamaecrista that grows in my yard (which some folks call sensitive plant) is that it will close its leaves when touched, but slowly enough so that you don’t actually observe it happening–you can just tell where someone brushed through the plants earlier. However, when I worked in the Uwharrie Forest (also in NC) in my youth, there was a chamaecrista genus member growing there (which I suppose might have been chamaecrista fasciculate) that had a much larger bloom and larger leaves. That plant would visibly and immediately close its leaves upon being touched. I learned so much from this article, and thoroughly enjoyed the images – thank you! Do you know of a related plant species native to southeast Arizona (or broader area of Chihuahuan Desert) that provides food for so many different animals with the bonus of putting nitrogen back into the soil? Hi Karen, I’m not as familiar with plants in your area, but most (not all) plants in the Pea (Fabaceae) family are nitrogen fixers, and many support a lot of wildlife. You could try the Lady Bird Johnson Wildflower Center Database: https://www.wildflower.org/plants/. It has a nice search feature. and the USDA Plant Database has useful info about where plants are native, sometimes with a write up of other features: https://plants.usda.gov/core/profile?symbol=CHNI2. Good luck! I’m glad you enjoyed the post. Lobely pictures. 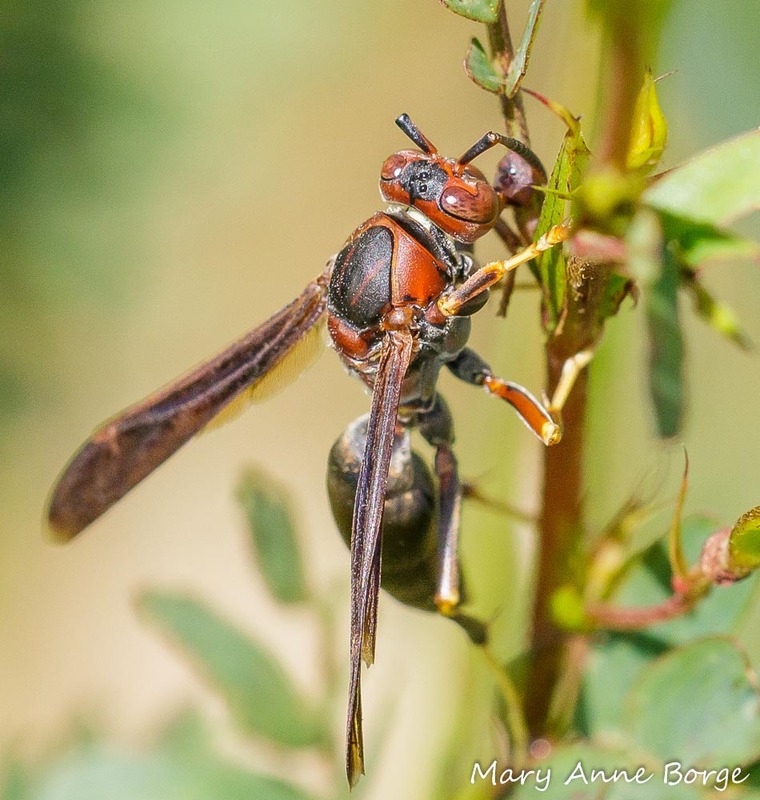 The paper wasp looks very interesting! I have never seen it before. Thank you! It’s amazing how many interesting critters you can see interacting with plants. They’re called Paper Wasps because they build their nests of a paper-like substance. I wanted to plant this in my yard but ended up getting Maryland Senna? I think. A perennial instead of an annual. I think the pollination is similar. The little pods of seeds are wildlife buffets. I had a flock of turkeys come into the yard after the pods. You’re right, Maryland Senna is buzz pollinated. Interestingly, Maryland Senna has some anthers with sterile pollen meant as a reward for pollinators, mostly Bumble Bees. While the bees harvest from those upper anthers, the lower anthers sprinkle their legs and abdomens with fertile pollen. So clever! I’ve photographed and noticed the peculiar arrangement of anthers in Maryland Senna. Thanks for this fascinating explanation. This was your best entry ever!! I will need to reread and take notes to glean all the information you offered here. The bonus photos of the butterflies were enchanting. As ever, your post makes my day. Thank you for the beautiful work. What beautiful pure yellow flowers. And I love all the insect life that you’ve photographed so clearly. Thanks for the great post! Aren’t they gorgeous? I’m glad you enjoyed it!